So Mare Barrow is seventeen and about to be sent off to war, because that’s what usually happens in these dystopias. The Silvers are needlessly wasting thousands of Red lives — though why they’re fighting a war is anyone’s guess — and Mare is trying to save her friend Kilorn from being drafted. The plan is to smuggle herself and Kilorn out of town with a woman called Farley, who also happens to be the leader of a secret Red rebellion called The Scarlet Guard. But then a chance encounter with a handsome stranger means that Mare finds herself in the Silver palace. Not sure how that plot progression worked? No, Mare neither, and she wonders how on earth she’s wound up working as a serving girl for the Silver royal family. 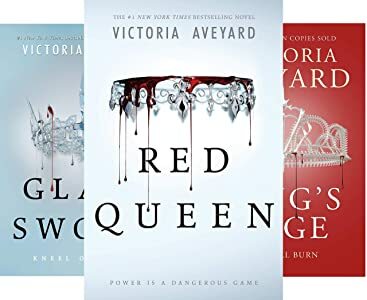 One thing that Red Queen does have going for it is the inclusion of superhero powers that owe much more to a comic book background than the YA-franchise recipe book Averyard seems to have swallowed. The Silvers have super powers, such as controlling water, mind reading, and manipulating metal (though even that was pinched off X-Men’s Magneto). Mare has one of these super powers, which causes a right fuss because only Silvers are supposed to have them. So that makes her Divergent. Or is that a different series? I know what you’re thinking: what is this story really missing? A love triangle! To cover up the scandal of a lowly Red having super powers, the Silver royal family decide that the only safe thing to do is marry Mare to one of their sons. I didn’t quite follow the logic on that one either, but never mind. There is Cal, the eldest son, and his younger brother Maven, who Mare is betrothed to. Two brothers, one betrothal. What’s a gal to do? Flit maniacally between them of course. There’s more blushing kisses swapped than you can shake a stick at, but you’ll be lucky to find yourself rooting for either prince. Aveyard’s plotting is just a touch too predictable to form any real attachment to the characters, and if you’ve read any of the teen dystopias released in the last ten years, you’ll know what’s coming anyway. Being the Red-with-super-powers hybrid that she is, Mare is an obvious symbol to inspire social change and rebellion, so she becomes the Mockingjay. Hang on, I might be getting confused again… Anyway, you can see how Mare’s lowly role as underdog teetering on the brink of leading a war against the Silvers could grip some readers. 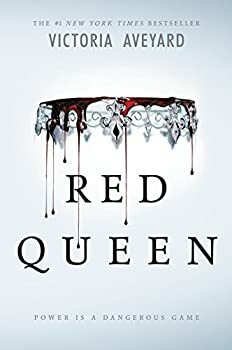 Indeed, Red Queen has done extraordinarily well amongst the teen audience, and for those few who haven’t picked up a YA dystopia before, there is definitely something compelling to be found in here. But for the more seasoned reader, this is perhaps one to avoid if you’re looking for something more original. Published February 10, 2015. Graceling meets The Selection in debut novelist Victoria Aveyard’s sweeping tale of seventeen-year-old Mare, a common girl whose once-latent magical power draws her into the dangerous intrigue of the king’s palace. Will her power save her or condemn her? Mare Barrow’s world is divided by blood–those with common, Red blood serve the Silver- blooded elite, who are gifted with superhuman abilities. Mare is a Red, scraping by as a thief in a poor, rural village, until a twist of fate throws her in front of the Silver court. Before the king, princes, and all the nobles, she discovers she has an ability of her own. To cover up this impossibility, the king forces her to play the role of a lost Silver princess and betroths her to one of his own sons. As Mare is drawn further into the Silver world, she risks everything and uses her new position to help the Scarlet Guard–a growing Red rebellion–even as her heart tugs her in an impossible direction. One wrong move can lead to her death, but in the dangerous game she plays, the only certainty is betrayal. I almost just bought this in a kindle sale, and now I’m glad I checked here first. Thanks for the review Ray! I really don’t understand how so many bad books get so popular.